Denton and Reddish MP, Andrew Gwynne, has called on the Government to increase funding for schools as part of a Labour Party Opposition Day Debate in the House of Commons. Whilst in government the Tories have slashed funding in every area of education from early years, to schools, to further and adult education, with billions of pounds lost since they first came to office in Spring 2010. Nothing has been done to begin reversing the devastating cuts to colleges and Sure Start centres, and the Chancellor had nothing to offer schools other than “little extras” at a time when they are struggling to afford the essentials. The independent Institute for Fiscal Studies have found that funding for Sure Start has been cut by two-thirds since 2010, with over £1 billion lost. More centres now operate on a part-time basis, and the numbers of services have fallen. According to the Sutton Trust, reduced services were reported by 55% of local authorities, with only 35% providing a range of ten or more services. Since 2015 the Tories have cut £2.7 billion from school budgets in England, with further Labour analysis of figures produced by the independent Institute for Fiscal Studies showing that school budgets are £1.7 billion lower in real terms than they were five years ago. On top of this Labour has found that nearly £1 billion has been cut from children’s services in real terms since 2012. The Prime Minister promised us that austerity was over, but the Budget made it clear that it will continue for years in our schools, colleges, and early years providers, in response at the Budget all the Chancellor offered schools during the Budget were “little extras”. This was a paltry £400 million in capital funding, after the Conservatives had cut the capital budget by £3.5 billion in real terms, so they are barely reversing a tenth of their cuts. 1. 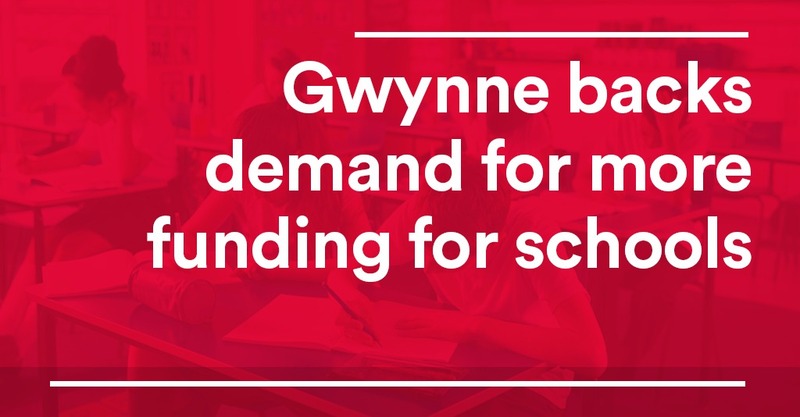 Investment – we will make sure schools are properly resourced by reversing the Conservatives’ cuts and ensuring that all schools have the resources they need. We will introduce a fairer funding formula that leaves no school worse off, while redressing the historical under funding of certain schools. Labour will also invest in new school buildings, including the phased removal of asbestos from existing schools. 2. Quality – we will drive up standards across the board, learning from examples of best practice, such as Labour’s London Challenge, to encourage co-operation and strong leadership across schools. We and trust in teachers and support staff professionalism to refocus their workload on what happens in the classroom. 3. Accountability – Labour will ensure that all schools are democratically accountable, including appropriate controls to see that they serve the public interest and their local communities. We will require joined-up admissions policies across local schools to enable councils to fulfil their responsibilities on child places, to simplify the admissions process for parents and to ensure that no child slips through the net. 4. Inclusion – Every child is unique, and a Labour-led education system will enable each to find their learning path through a wide choice of courses and qualifications. We will invest in measures to close the attainment gap between children from different backgrounds. “The Prime Minister told us that austerity was over and promised she would end the pay cuts for public servants, but it is becoming clearer by the day that this doesn’t apply to our schools and teachers. In stark contrast to their words, the government’s own figures show that a quarter of a million teachers – nearly half the entire workforce – are now facing another real terms cut to their pay this year. It is now clear that far from just needing “little extras” as the Chancellor claimed, schools aren’t even being funded for the very basics. “Not only are these Tory cuts short sighted, they will damage our education system in the long term leaving our children’s education to a lower standard than it ought to be. I will hold this government to account for all those children and young people who rely on us to ensure the education system is well funded for Tameside, Stockport and the whole country.